I was poking at Locke the other day when he said that one of the questions on his Crossing Zebra's interview was about him being a trillionare. With graceful modesty he said that he only has a hundred billion or so. I give him credit for admitting that his ISK worth is a bit higher than poor. The interview itself is about industry but industry is also about wealth and the relative wealth of the people discussing industry is an important bit of information for the listener. My conversation with Locke was what would one do with hundreds of billions of ISK. What is the reason to have so much ISK. Locke works in a very technical fashion. Investment of his ISK, the ISK working to create more ISK and such ventures are important to him. While I am the opposite. Lounging on a massive pile of ISK while polishing each individual piece tickles me. 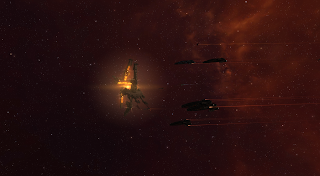 ISK is a foundation to do things in Eve. The nature of the sandbox lets us do what we want. But what we want is limited by what we have and what we can think of. There is the game that CCP has given us and there is the game that we have created for ourselves. They are interlaced but they can also be played separately. Think of scammers or people who sell bookmarks or run sites like Blink. You can compare that to incursion runners or explorers. Market trading is one of those areas that exist on each side. "What do you need money for except to buy more ships?" Eve being what you make of it, if everyone had that particular attitude not much would get done. For some an empty wallet means nothing as long as they have a ship in the hangar. For others, with more focus on planning and projects, and empty wallet is an irritation. Being a planner by nature I am confused by people who so cheerfully live in the now. Even in a video game I am a planner. While Locke was mostly harassing me (for he and I are like oil and water in a soup) I was puzzled by an ISK limit where people feel Eve is 'won'. The more ISK you have the more you can do. I do not consider myself to be a generous person. However, to enable others ISK is often needed. It be my store or composing a fleet and hanging out ships it seems as if the use of ISK in productive game play is endless. It also shows how the concept of ISK changes. Almost two years ago I was struggling, frantically, to reach and hold a hundred million ISK. Dominix also cost forty million ISK at that point. How a few expansions change things. At that time a billion ISK seemed like it would be enough for anything I wanted to do. I had no idea that I'd develop a taste for projects and an acceptance of funding them myself. When I discuss projects like TCS with people I point out that I started with a comfortable bit of seed money. Even living in low sec one of the first discussions is, "Do you have your own source of independent income?" When I joined 7-2 I gave up Sugar as a money maker so that I could go on deployments and do things where I did not have to pull Sugar to the side to assist in ISK making. In that process I created new goals for myself and new things to do that keep me motivated. Perhaps if I were a trillionair I'd feel different. My excitement dulled by the reality. Yet, I do consider making ISK part of my game. I enjoy the acquisition of it. I've learned to stop voicing my disagreement at those who speak of the boredom they must endure to earn it in the same way I've learned to not speak around min/maxers. It is a different game play decision and one that does not mesh with my view of the game. In my quest for space richness I discovered that my tolerance is very, very limited for things I did not enjoy. One of the things that I did not enjoy was doing a task based off of numbers and not interest. Right now, for instance, I am saving up for a jump freighter. I am halfway there. I could buy it at any time. I don't because I have a particular, personal limit I don't like for my wallet to drop below. That limit is a personal motivator. It keeps me interested and active in various activities to maintain myself. I do not think it is any different than people aiming to be on the top of their kill boards or any other personal achievement or goal that is set. ISK is freedom. ISK is also confinement. ISK is also a Macherial fleet. I can understand how null sec can be appealing with their offers of free ships. The work is to show up and have fights. It also creates a motivation to support the social group. If the group goes down so does the pilots life style. I've been watching people burn out on Eve recently. I've also heard the lament of, "I just want to log in and get some action." If it were another game the ISK wouldn't matter but so much. But it is Eve, the game of real loss and real gain transcribed into pixels and internet spaceships. I'm sure there is enough isk and wallowing in ISK. I'm just far from that point. I can still see so many things to do still. Maybe in a few more years I can write a bitter post of grumpiness spiced with some jaded emotion. For now I am making sand angels.